A new cookbook by Annette Kesler is always reason to celebrate, and when the book has the backing of the Heart Foundation, with every recipe approved as part of their eating plan, things become even more interesting. Following Annette’s best-selling Learn To Cook (Human & Rousseau) and incorporating the newest recipe creations from this well-loved, award-winning author and editor of South Africa’s premier food and travel website --- www.showcook.com --- cooking “Step by Step” has never tasted better. Nor looked so good, thanks to photographs by esteemed photographer Franz Lauinger. En route to cooking up the delicious dishes, kitchen wizards are guided by detailed pics and explicit instructions. Tracking the very latest healthy eating options and sound menu planning for the whole family, the aims of FRESH & HEALTHY – Step by Step to life – are a clearly defined, offering a sustainable blueprint. One that embraces words such as “simple”, “fresh”, “substantial” and, of course, “utterly delicious” and “healthy”. 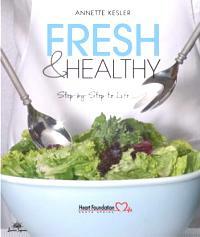 The book is a timely publication, as South Africans are searching for ways of living (and eating) in a more healthy way. Rounding out the message, each recipe has been analyzed by the Heart Foundation, and per serving indications are given for energy, fat, cholesterol, carbohydrate and fibre content. Heart-health topics also have space in the book, from exercise to medication; cholesterol management to understanding stress.